Last quarter, Apple guided the Street that Q1 would be softer than investors expected. Our analysis of consumer demand around the world indicates the rumors of Apple’s demise may be vastly exaggerated. We track consumer demand around the world and saw Q1 CY 2014 have a significant boost for Apple at retailers around the world. Whether this translates to increased revenue for Apple remains to be see when they announce earnings on 23 Apr. During Q1 many retailers had significant promotions on iPhones, notably Verizon’s efforts to defend against aggression by T-Mobile and AT&T let to significant demand for iPhones, Samsung’s Galaxy Note 3 and S4, and surprisingly Motorola made DROID smartphones. This could be Verizon seeking to cleanout excess inventory of smartphones whose hype did not translate into record sales as anticipated. Consumer iPhone buzz in Q1 was higher than Q4, an indication of increased sell through in Q1 for retailers. Consumer discussions of the Price/Value trade-off for iPhones also increased during Q1, supporting the notion that lower prices for these still relatively newly launched handsets is part of what drove increased demand. Best Buy’s promotions on the iPhone 5C over the holidays led to not only increased market adoption of the 5C but also a clearing of unwanted inventory by the large retailer in the face of much lower than expected sales for this entry level iPhone. 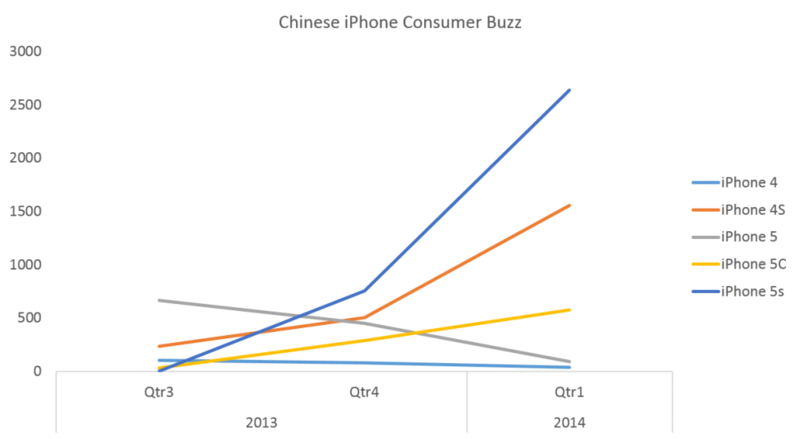 Demand in China supports the assessment of increased Sell Through as well, with overall iPhone consumer buzz at an all time high. Keeping in line with the lopsided performance at launch, the iPhone 5S received five times the buzz of the iPhone 5C. What was most surprising though was the huge increase in iPhone 4S buzz, more than doubling the demand for the iPhone 5C. Whether this created increased revenues for Apple remains to be seen. Consumer discussions of Price/Value of recent iPhone purchases increased in Q1. Analysis of Chinese Consumer demand shows continued slow adoption of iPhone 5C but a big boost overall for Apple in Q1. 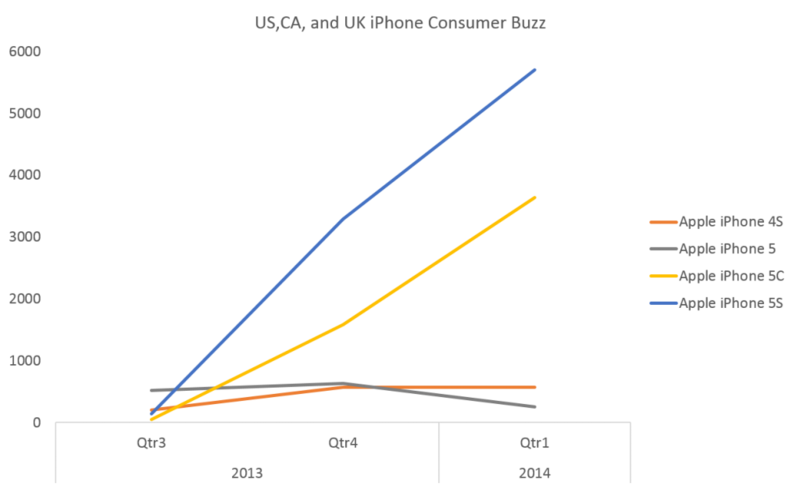 Around the world, we see increased demand for iPhones, prompting our assessment of increased sell through for Apple during Q1 2014. Whether this translates to increased revenue for Apple in the next quarter remains to be seen but so far competitive moves by Samsung and HTC have not impacted consumer demand globally for what Apple has to offer.